Sach Pass has been declared closed for all type of vehicles for this season. Like previous years, this will remain to be a dedicated post for Sach Pass Status 2019; and condition of the road across the pass. For more recent news on the road and a visual update, please continue to follow and check the Forum Thread. Sach Pass and Rohtang Pass both received fresh snow last week bringing the snow clearing operation to a standstill. The work has now been resumed and Rohtang is expected to open in next couple of weeks. Sach Pass will not get open until June 1st week at earliest. If you are planning on visiting Sach Pass next year, then I will recommend taking a look at the following posts for information on how you can best plan your trip. Historically, Sach Pass is usually the last pass to be declared open sometime in the month of June. It is also the first one to receive snow and get closed by late September or early October. Please see the Forum Thread for latest updates and pictures of the route. BRO is going to start snow clearance operation in a day or two from Satingri toward Tandi and Sissu. Similarly, BRO workforce and machinery is moving from Udaipur ahead toward Kolang. From Manali side, work to clear snow on Gulaba Rohtang stretch will commence in a week to 10 days. There are still warnings of snowfall in coming days which may cause the work to get delayed all across. Heavy snowfall has occurred all across Himalayas in last couple weeks. Avalanches at several places have been reported, triggered due to widespread snowfall. The valleys of Lahaul and Spiti have been affected badly. So far two motorable bridges, four dhabas, a Mahila Mandal building, a liquor shop and some machinery have been damaged in Spiti. The Tandi petrol pump in Lahaul Valley was hit by an avalanche and destroyed. Bairagarh right now is buried deep under snow, as shown in the pictures I posted below. For now, the expected date of opening of the pass will remain to be around mid of June. 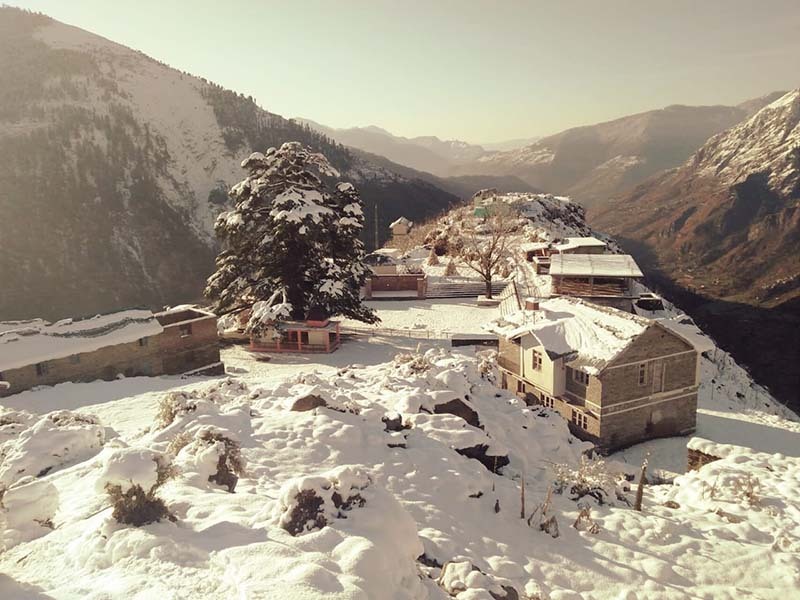 The recent spell of snow all across Himalayas has seen a lot of snow getting accumulated in the hills. The snow this year in fact is far greater than the last few. More snow is expected throughout the month of February. 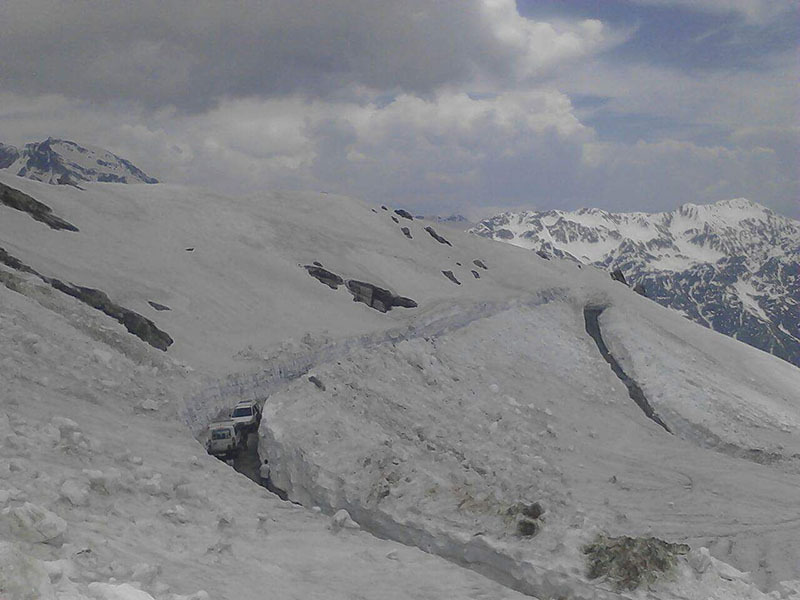 For now, do not plan to visit Sach Pass any sooner than the month of June. Sharing a recent picture of the road near Bairagarh. Sharing a recent picture of the road near Sach after the pass experienced a heavy snowfall in October. After the surprising snowfall across Spiti and Pangi Valley in September this year, Sach Pass was closed for a few days due to heavy amount of snow at the top. It was opened a few days later but all the snow and resulting slush was making it too risky to get across. As a result, it was again declared closed for the season. The check post at Satrundi was moved back to Bairagarh and that is as far as you can currently go. Similarly, the road from Tandi to Kishtwar via Killar is closed as well. As of now, Sinthan top is open and you can travel to Kishtwar but cannot cross Sach to get to Killar and Tandi. As of now, planning a trip to Sach Pass is only open next year after June. I hope the information above was of help. For recent updates, please follow the Forum Thread or look through the comments section below. If you have any other questions; or need any further details; please feel free to comment and ask; and I will be glad to answer. Heya. Ur blogs seem to be really helpful. Could u please let me know the current status of Sach Pass? Do u think it will be good to plan Delhi – Banikhet – Sach Pass – Killar – Keylong – Kaza- tabo Nako – Kalpa – Delhi in mid June on bike? It is closed right now but yes, it should be open by June 2nd week. Thanks for the quick revert!! Heavy snowfall has occurred all across Himalayas in last couple weeks. Avalanches at several places have been reported, triggered due to widespread snowfall. The valleys of Lahaul and Spiti have been affected badly. So far two motorable bridges, four dhabas, a Mahila Mandal building, a liquor shop and some machinery have been damaged in Spiti. The Tandi petrol pump in Lahaul Valley was hit by an avalanche and destroyed. Please see the Forum Thread for a picture of the petrol station after avalanche. Bairagarh right now is buried deep under snow, as shown in the pictues. For now, the expected date of opening of the pass will remain to be around mid of June.